A man charged with murdering his partner accused her of chatting up men on Facebook an hour before he strangled her, a jury has been told. Brian Lewis, 31, is said to have killed mother-of-four Hayley Jones, 26, after she altered her website status from "married" to "single". 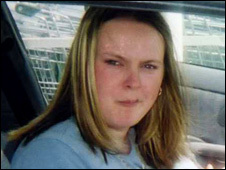 But Ms Jones's best friend told Cardiff Crown Court she used the website only to communicate with family and friends. Mr Lewis, of New Tredegar, Caerphilly county, denies murder. The court has heard that he attacked Ms Jones with a kitchen knife in the middle of the night as she was sleeping on the settee at their home, stabbing her through three layers of clothing and two sleeping bags. He then dialled 999 and told police to come to the house but fled the scene, leaving the couple's four children to find their mother's body, before he later gave himself up. Tina Prosser told the jury: "Brian used to tell me she was on Facebook all the time - he said he didn't like it. "He thought she was seeing someone else but I tried to explain to him that nothing was going on. She added: "We used to talk on Facebook a lot, there were a lot of friends and family using it." Mark Evans QC, prosecuting, asked Mrs Prosser: "Was Brian Lewis part of the group involved in Facebook? " She said Mr Lewis accused his partner of chatting up other men online just an hour before he allegedly attacked her. She said: "Brian was having a go at her, saying she thought more of the computer than she did of him. "He said the only reason she was on there was to chat to all the boys. Hayley just sat there and ignored him." Within an hour of Mrs Prosser leaving the couple's home, Ms Jones was dead, the court was told. The jury has heard that Mr Lewis told his drinking friends that if he could not have her, no-one else would, because "I'd kill her first". The couple had been together since Ms Jones was 13, and together had four children aged from 10 to three. The court has heard that they never married but regarded themselves as husband and wife until she changed her Facebook status 10 days before she died.